● The first layer is the standard transactional layer in which basic wallets earn rewards for block formation. ● Provide network security and confirm blocks of transactions that constitute the blockchain, the ledger of immutable transactions. ● Maintain a full copy of the blockchain. 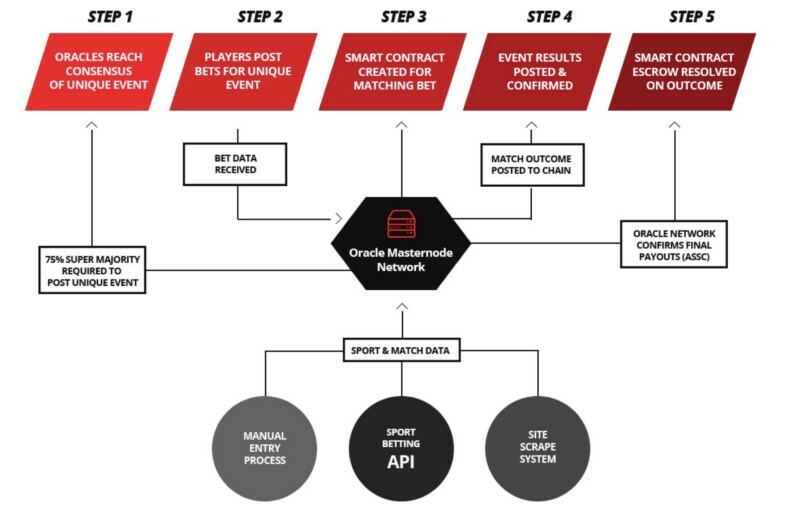 ● Oracle Masternodes, a second layer of the Wagerr network, function as consensus agents, forging betting contracts, retrieving sporting events outcomes data, and consensually validating results that trigger contractual payouts. Peer to peer betting (or “head to head” betting) requires two partners to take opposite sides of a betting contract. The players agree on the betting line and the total amount at stake. One player initiates the bet by posting it to the blockchain from their wallet. When the partner sends coins for the complementary side of the bet, the blockchain tags them as transactions with dispositions contingent upon the outcome of the specified event. Once the event is completed, the Oracle Masternode network records the performance result on the blockchain, triggering a payout to the winner. If the event never happens, the coins, minus fees, are returned to the original transactors. This feature is great for casual players, friends who live apart, colleagues, etc. They can make a plan, forge a contract on the blockchain, and leave the rest to the Wagerr network. Multi User betting is like peer to peer betting, but in this case multiple users can take the complementary position against a larger bet until the total value of the bet is met. Since this mode of betting requires less specificity about the size of the bet, the blockchain can perform the work of matching multiple bets until an equally weighted or minimum contract is achieved. Peerless betting does not require a complementary transaction to forge a contract. 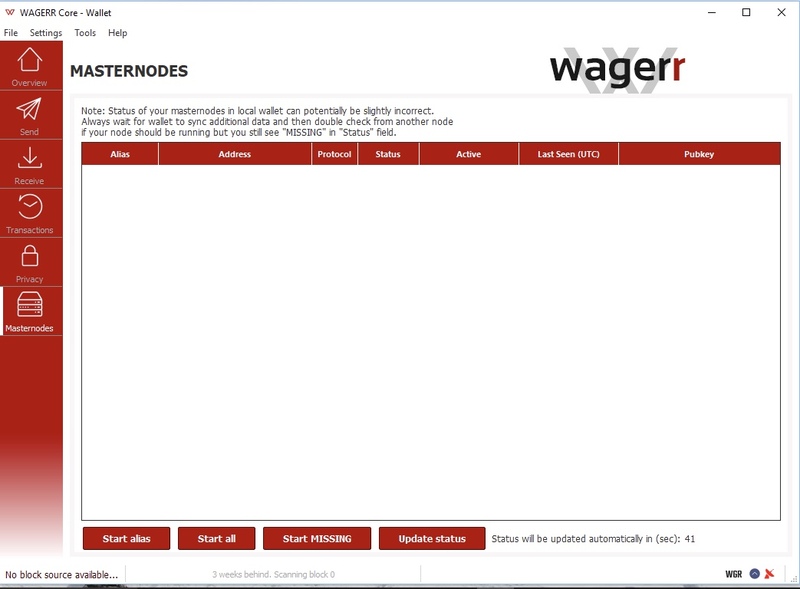 Any bettor can initiate a contract on chain, which the Wagerr network is programmed to pay out if the bettor wins. Peerless betting maximizes flexibility for bettors. How does Wagerr balance the risks of peerless betting? The blockchain pays out winning bets that are confirmed by the Oracle Masternode network, by minting coins for the payout. This means that the blockchain does accrue some risk of coin supply expansion though forging such contracts, but the risk is balanced by several factors. Losing bets systematically destroy coins, creating a balance over time. That’s because 48% of all betting fees are destroyed, tipping that balance in favor of net coin destruction from direct chain betting. In fact, because losing bets destroy more coins than winning bets generate coins on the network, an intrinsic advantage is created for all WGR holders in terms of coin supply. Specifically, on a losing bet of 100 WGR, 96.88 WGR would be destroyed; by contrast, on a winning bet of 100 WGR, only 94 WGR would be generated. This imbalance constitutes the house edge of approximately 3%. The final technological balance is a development called, “dynamic odds balancing.” When peerless betting creates an imbalance in risk, where the payout liability is higher for winning than for losing, the network dynamically adjusts odds to encourage complementary betting that will balance the network liability. Peerless betting is by far the simplest solution for sports bettors because it requires no planning, and eliminates the risk of finding complementary partners. Peerless betting also attracts traditional sports betting operations that routinely manage their own payout liability by placing bets with peer organizations. Now, instead of relying on their peers to take the other side, major sports betting outfits can enjoy low fee betting on the trustless Wagerr system instead of entrusting assets to competitors. That’s important because regulated competitors are subject to regulatory insecurity and unregulated competitors have no legal obligation to honor agreements. 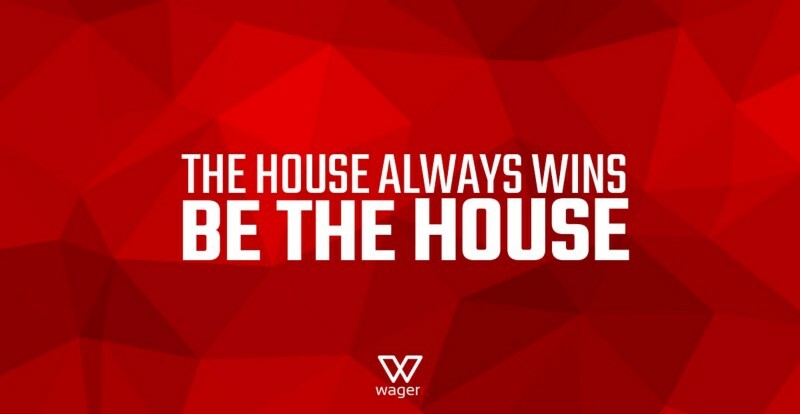 Wagerr, a decentralized technological system, does not require sports bettors or sports betting organizations to trust any one party whose trustworthiness cannot be verified. Users instead entrust verifiable open source code that they can inspect for themselves. The estimated scale of the traditional sports betting market (including bothlegal and illegal bets, internationally) is in the trillions of USD. An estimated $400 billion dollars illegal bets are placed annually in the United States alone. China’s illegal betting market is even more extensive. Traditional sports betting in many locales is driven underground, leading to corruption, unfairness, and violence. Wagerr offers this untapped market the opportunity to choose a safe, private, and accessible way to bet through decentralized blockchain technology. Because Wagerr is (better) decentralized, private, and lower-fee with a compelling value proposition, Wagerr has the potential to win substantial market share in the long run. However, even if Wagerr only captures a fraction of the trillion dollar market, the world will be a little safer and the mechanisms built into the Wagerr model will have a powerful and overwhelmingly positive effect on the Wagerr economy, and long term token value. “Value coupling,” in particular, creates an extraordinary value proposition for sports bettors, the sports betting industry, and for investors at every scale. The value of the Wagerr token (WGR) is systematically tied to the use of the sports betting blockchain. The Wagerr network reduces the risk to value and protects holders of WGR tokens by linking betting volume to coin supply. This “value coupling” between usage and supply is a built-in deflationary mechanism that destroys 48% of the fee from every bet. With fees of 2%-6%, the net result is nearly 1-3% of every bet permanently removed from the network. For example, if price falls dramatically, significantly more outstanding supply is destroyed with every bet, because bets now require more WGR. Conversely, if price rises dramatically, significantly less supply is destroyed. Over time, this leads to less market volatility and an asset value that more accurately reflects both adoption and usage. Wagerr’s systematic destruction of fees thus creates supply scarcity over time. As the average volume of betting activity over the Wagerr network rises, the value of Wagerr rises with it, enabling all investors to participate in its strong growth potential simply by holding WGR tokens. At any point in time the price of Wagerr combined with the volume of bets defines how much deflation takes place on the Wagerr blockchain. See for yourself how these three variables interact with the Interactive Value Calculator on wagerr.com. Wagerr is designed to be more than a blockchain, it is designed to be a responsive and price linked economy. For users to feel safe holding the token and to bet with it, they need to have confidence in the value backing the coin. In Wagerr’s case the method of ensuring that the value grows over time is by creating a deflationary economy. Why not make Wagerr an asset backed coin? Asset backed coins are powerful and have proven to be valuable in the crypto space. Wagerr, however, was designed to be fully decentralized. Since ownership and control by a central authority are required to back the value of an asset, the requirements are incompatible with the function of the Wagerr network. Wagerr is custom built for sports bettors and the sports betting industry. For a low fee, players can place their bets in secure escrow. Winners get automatic payouts after the event outcome is confirmed on the blockchain through consensual validation. The Wagerr network confirms real world gaming results accurately because of strict enforcement of the requirements for Oracle Masternodes participation. The penalties for Oracles that attempt to feed bad data to the network are prohibitive. Supermajority (75%) consensus among the Oracle Masternode network is required in order to post game results on the blockchain, making result security extraordinarily robust. There's no risk of overleveraged betting in the Wagerr system because no one can bet more WGR than they have. Loan sharks and associated violence are excluded from the Wagerr network. because they can place larger bets with smaller amounts of initial capital. increasing the value of the payout. initial capital at stake remains nominal while the reward potential continues to grow. Traditional sportsbooks frequently find that they have taken on too much payout liability when their customers’ bets are unbalanced, strongly favoring one side. If the overweighted team wins, the sportsbook has to carry that cost against their bottom line. They typically manage their liability by placing bets, themselves, with competing sportsbooks. Wagerr offers lower fees, automated payouts, and strong security against manipulation. Even though Wagerr will function as a competitor to traditional sportsbooks, the blockchain also offers a potent solution at a competitive price. reassure potential investors of the feasibility of fully achieving the Wagerr network vision. So, what does Wagerr bring to the table that’s relevant to the field of digital currencies? There are three types of betting transactions on the Wagerr network. The blockchain mediates bets between two players taking opposite sides on upcoming processing Oracle and 1% gets burned. Here is the flow of a head to head bet from start to finish. same event defined by the Event’s UTC Time, and their unique identifying codes. posted bets or set a new line and matched amount (for a taker or bet partner to fill). on the two opposing bets predicted outcome. to be signaled for resolution. resolved the oracle who processes the bet receives their portion of the fee. of a multiple user bet from start to finish. multiple user bet from start to finish. Sport Leagues supported at launch. efficient and powerful, and not overloaded with functions and features. posting mechanisms for how they collect and post data is also near completion. is committed to the long term vision of the project and will deliver on launch commitments. processing Oracle and 1% gets burned. to know who they are betting against and talk about the event live while it happens. processing the transaction and 2% gets burned. looking for a match and bet directly against the chain, which takes the other side of the bet automatically. The fee for this transaction is 6 percent. 3% of the fee goes to the Oracle that processes the request and 3% is automatically burned. ● Q2 2018 - Dynamic Odds Balancing. For Direct on Chain betting, Wagerr incentivizes betting on the other side when one side gets overweighted. This feature allows the Wagerr chain to ensure that it exposes the network to the smallest amount of payout liability. dependent on the later rounds success. participants would receive a 8% bonus and so on. bonus of 4%, participants in round two would receive a 3% bonus and so on. Funding milestones secure the development of major features on the Wagerr road map. Round 5 secures Direct On Chain Betting. Rounds. The hard cap for maximum token issuance is 200 million tokens. the largest reserve of ICO funds, ensuring that talent can be attracted. toward these goals, and promote the advantages of decentralized sports betting. advocacy and lobbying to promote open access worldwide. Communications to advise Wagerr development, messaging, and overall goals. and Consulting to advance the project. movements and sales to fund any portion of the plan. 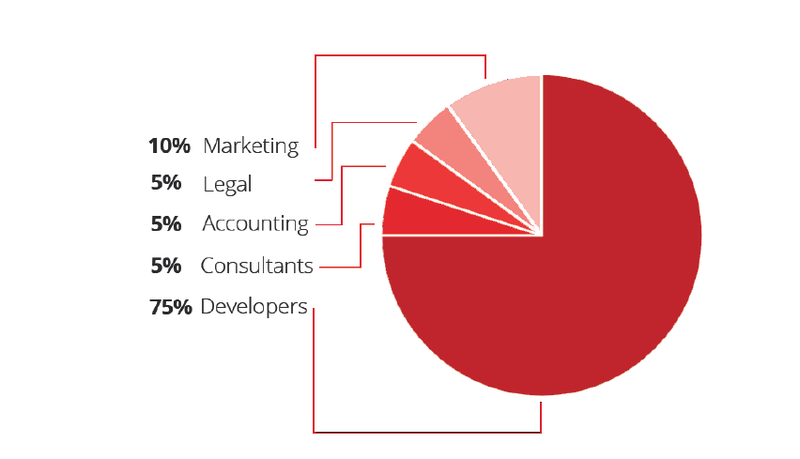 This diagram shows the allocation of funds that are raised via selling WGR in the ICO. Help us spread the word about the Wagerr ICO. If you have a Twitter following of people who would participate in a great ICO, we need you to retweet our content. The structure of our campaign reflects our goal. We value your time and your effort and we intend to reward you accordingly. We will not reward campaign participants who merely retweet to themselves or made up audiences. Participants who don't contribute to the goal will be dismissed from the program without pay. In order to participate you must have at least 15 followers and be among the first 250 to sign up for the campaign. Sign up for an account on wagerr.comwagerr.com email (the one you signed up with)l to @wagerrx on twitter. Campaign will continue at least until the ICO begins, June 1st. Check back then! We may renew it another week. Twitter accounts must have legitimate traffic. Campaign monitors are authorized to remove non-contributing accounts without pay if they identify tweet farming. If you bought the ICO early, congratulations! for Mac and Windows and see for yourself. now pledges to deliver a WGR exchange service directly in the wallet. Golden tickets — 15,000 Wagerr each! Wagerr ICO closes in less than 36hrs. Wagerr Crowdsale closes on 25. Jun 2017. The Wagerr Team has created and verified the Wagerr asset token with Waves! The Waves network proved to be an extraordinary match with the needs of the Wagerr community compared to other asset token issuance blockchains because it features a built in exchange, fiat gateway, fast and reliable transfers, and lightweight, user friendly wallets on all devices. We are excited to issue intermediary Wagerr tokens on this groundbreaking platform. Only Trade Verified Tokens You will know that the Wagerr token is authentic when your Waves client shows a green check mark ✅ next to the token name “Wagerr” with the official token ID 8t8DMJFQu5GEhvAetiA8aHa3yPjxLj54sBnZsjnJ5dsw. The “verified” status will reflect in all Waves wallets, pending a Waves system update which propagates the verification across the Waves network. Only after this verified status displays in all wallets will Wagerr tokens be available to withdraw to personal Waves wallets. Verification is a precautionary step the Wagerr team is taking for the security of ICO participants, potential new investors, and the community. Round bonuses and bounties Round bonuses will be credited to accounts within the next 24 hours. Bounty coins will be handled shortly after. We’ll be sending out an email with detailed instructions for accessing your Wagerr tokens over Waves as soon as they are available for withdrawal. It has been a whirlwind since the completion of the Wagerr crowdsale, the team has had their heads down churning away on development, this has led to a bit of a communications vacuum. Moving forward we expect regular communication and Monthly news updates to show progress and major news. Wagerr has successfully hired 2 new capable developers, and is currently seeking a third. The qualified Developers are talented in C++ and has previous blockchain experience, this should ensure we keep on target with our projected timeline, as well as planned feature implementation. On our internal private testnet we have tested a head to head blockchain bet, successfully embedding betting information into the transactions. Additionally, the Wagerr roadmap will be updated over the weekend with new features to be implemented for reaching our crowdsale stretch goals. We have been focused on finalizing the atomic pairing of Head to Head bets. This is critical for us to ensure that the chain does not process bets/transactions that do not have pairs. After we finalize that code we will be moving on to decentralizing the oracle network. The process for that includes us unifying the posting language and allowing the checkpoint blocks to determine consensus. The response on Mayweather vs McGregor has been tremendous. Nearly ¾ of a million wager have been put on the line, which means one thing…. As it will be on the live chain, Wagerr will be burning the fees. Should the bet result in Wagerr.com carrying a loss, the team will cover it out of the funds allocated to compensate the original developers of Wagerr. We are working on a partnership with a Bitcoin ATM company that would make wagerr integrated into every BTM they deploy, this would make it easier for normal users to get fiat in and out of the wagerr network. Download WagerrLiteWallet5.1.zip from the Wagerr Github. this you will retain all your login information. foundation that supports all projected developments. will be using centralized oracles at the end of this month. Wagerr (WGR) Mainnet launch on track. Team expands. make the necessary changes in design. Consequently, we anticipate a 3-6 month delay of some near-term targets. One crucial and exciting component we intend to launch on schedule is the Wagerr mainnet. sandboxed in a limited testnet, which will launch and run in parallel. Our target for mainnet+testnet is January 15.
exchanges, for instance, cracked the price of Bitcoin in days. trustless system that disrupts autocratic centralized abuses of power. Betting belongs on the blockchain for good reason. 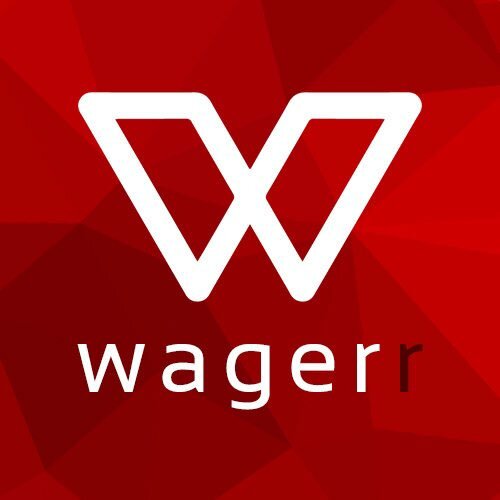 Wagerr is a revolutionary decentralized sportsbook that brings trust-less sports betting to the entire world. Using a decentralized blockchain, Wagerr will elevate the sports betting industry, and usher in a new trust-less era of fairness, availability and security. The Wagerr main and test networks will launch concurrently on Jan 15th, 2018. What is an Oracle Masternode? Typical cryptocurrency masternodes are nodes running the same wallet software on the same blockchain to provide extra services to the network, usually fulfilling the roles of transaction verification and governance. A Wagerr Oracle Masternode fulfils these roles, and much more. Oracles act as consensus agents that retrieve real world sporting event data, and records the outcomes on the blockchain. This is then used by the network to determine winning bets. They also act as masternodes in that they exclusively forge betting smart contracts backed by their collateral. They form a strong second tier network backbone that efficiently processes bets and events. A strong second tier network ensures distributed consensus and reliable operation. Each betting type has its own unique type of transaction, and by having bets take place on the second tier of the network, this allows us to ensure scale when it comes to creating consensus for determining winners and losers. Oracles not only collect 50% of the betting fees for their work, but also win a portion of the fixed periodic block award. What’s more, the Wagerr tokens earned can increase in value as the Wagerr economy grows. Their status is so prestigious that the number of Oracle Masternodes is limited to only 2,000. This ensures fair compensation for their unique type of work. What does an Oracle Masternode Do and How Does it Function? Oracle Masternodes’ primary function is to regularly post new upcoming events in the sporting world so users can bet on their outcomes. Once events are finished, Oracles post the outcomes to allow for all bets to be resolved. Oracle Masternodes form a second layer of the Wagerr network and function as consensus agents, forging betting contracts, retrieving sporting events outcome data, and consensually validating results, which are able to execute contractual pay-outs. Wagerr is dependent on Oracle Masternodes to accurately report real match data, allowing for bets to be published and resolved correctly. There are multiple ways Oracle Masternodes can gather sports information. Regardless of the source, the information must be formatted correctly to ensure the publication reaches consensus with the rest of the network. To ensure not all Oracles are pulling data from the same source, Wagerr requires the Oracle to report its data source to the network, and if required the network can force a limit on each source. Event outcome is confirmed only after 75% of all Oracles achieve consensus on the results. 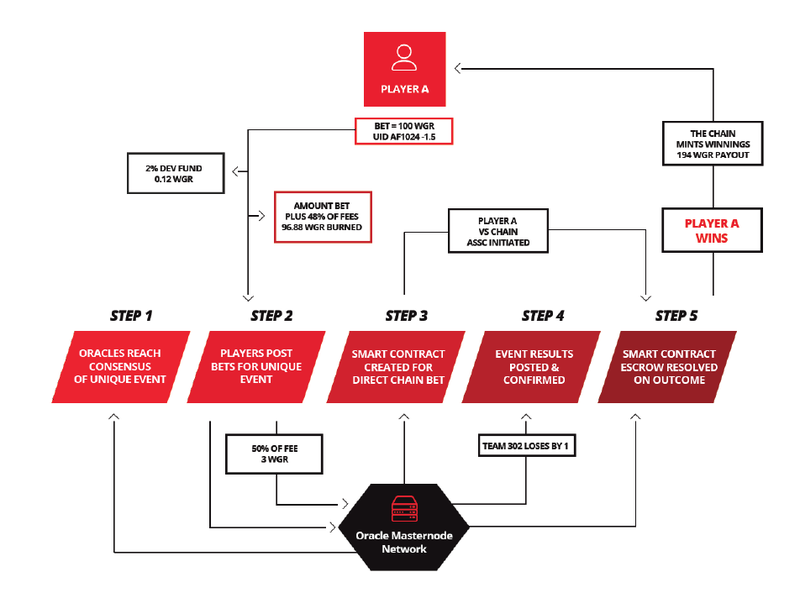 Once the outcome is confirmed and published, the Wagerr network recognizes fulfilment of the contract, and the winning user is paid out accordingly. Activating an Oracle is the process by which an individual chooses to promote their node, engage in a 30-day contract of service, and become a consensus agent. This contract ensures that owners must maintain a level of service, and agree to lock collateralized tokens to a simple smart contract which initiates a timed release. When all 2,000 Oracle slots are filled, anyone wishing to operate an Oracle Masternode will have to join a queue, and will be awarded a slot as they become available, on a first come, first served basis. 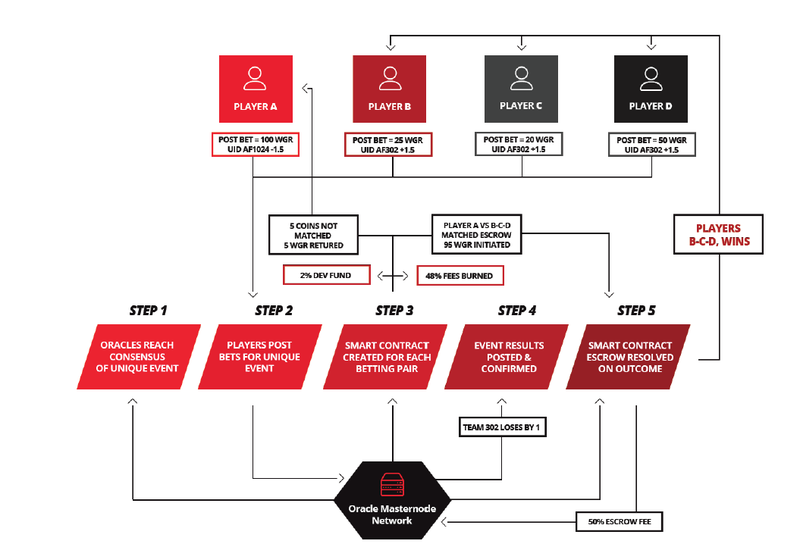 A visual representation of a typical bet on the Wagerr network is embedded below, along with steps detailing an Oracle’s function during each stage of the process. Step 1 – Oracles actively searching for new events inside supported leagues, always trying to build consensus for upcoming events. Consensus for a new event requires a supermajority; From the 2000 possible Oracle Masternodes, 75% need to report the same event, defined by the event’s UTC time, and their unique identifying codes. Step 2 – Users can view published events, and place bets against existing bets, or set a new line and match amount (for a take or bet partner to fill). Once betting pairs are determined to be complementary, a smart contact can be created and initiated on the Wagerr blockchain. Step 3 – Now that a smart contract is initiated, half of the fees within that bet contract are distributed and burned. (48% destroyed, 2% to Wagerr development fund) The Oracle Masternodes create transactions dependent on the two opposing bets’ predicted outcome. Step 4 – After the event concludes, the network relies on supermajority consensus to determine the outcome of the event. This posting allows the contract to be signalled for resolution. Step 5 – Once the bet has been signalled for resolution, the winning bets are processed and paid out accordingly. Once the smart contract is resolved, the oracle who processes the bet receives their portion of the fee. Why Would I Want an Oracle Masternode? Oracle Masternodes offer the most incentive to investors because they win ongoing staking awards, while also earning fees for forging betting contracts, and updating real life event outcomes on the blockchain. In the Wagerr system, the Oracle Masternode gives you the opportunity to be the house. 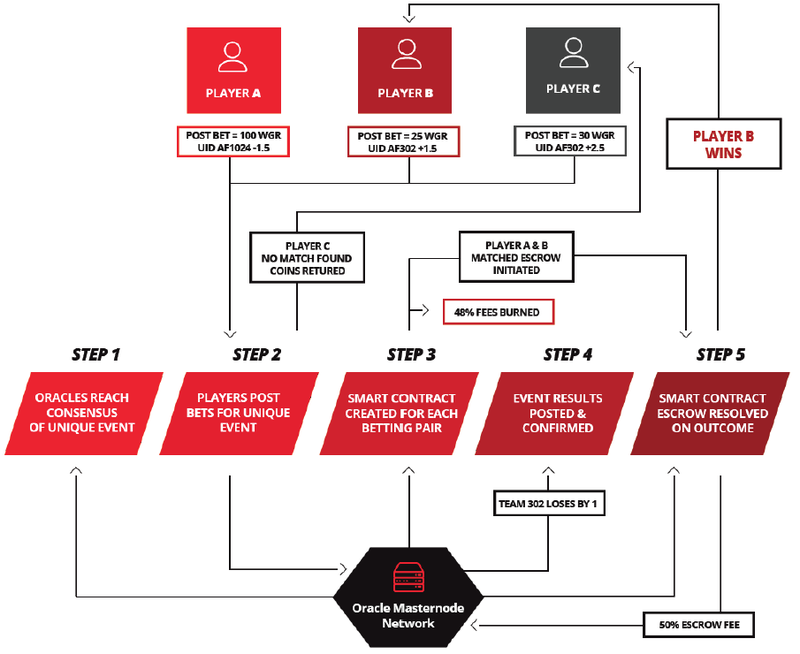 The system of rewards incentivises Oracle’s crucial role as consensus agents, retrieving and consensually validating sporting event outcomes, arguably the most crucial role on a sports betting blockchain. Static block rewards incentivise node operators to hold Wagerr tokens and operate wallets with 24/7 connectivity. Failure to consistently retrieve and post data that aligns with the consensus results in deactivation. Because the rewards for operating Oracle Masternodes are predictably far greater in the long run than liquidating them, investors will be loath to give up the residual income they generate. Masternode and staking rewards keep coins in active use in the network, and keeps their holders from adding sell pressure to the market. If Wagerr can obtain just 1% of the $400 billion that is illegally wagered on sports in the United States alone each year, according to NBA commissioner Adam Silver, each Oracle Masternode would gain over $40,000 in fees each year (assuming a full masternode pool and 4% multi-user betting fee). Oracle Masternodes will become vehicles of blockchain governance. Since no one has more invested in the wellbeing of the Wagerr network, Oracle operators will exercise governance through the distributed network of Oracle Masternodes. Once the distributed network is established and stable, the original Wagerr development team will fully relinquish control of the github and distribute the role of governance to the network. The Wagerr network achieves decentralized governance through a voting system in which each Oracle Masternode holds a vote. This second tier of the network extends the principles of proof of stake to the most heavily invested Oracle Masternodes which perform the essential functions of the sports betting blockchain. Types of governance required includes resolving pay-out disputes, managing the penalisation and demotion of underperforming nodes, and perhaps most importantly, voting. A decentralized voting mechanism within the Wagerr wallet allows network and protocol changes to be proposed. Voting will also allow proposals for future features or functions to be added to the ecosystem. Oracles will even be able to propose and vote on major fixes or proposed economic changes like increasing the maximum Oracle count, fees’ structure and raising or lowering block rewards to name a few. From there, the Oracle Masternodes vote on the proposal. Each change or modification passed with two thirds majority Is deployed to the main network automatically. Oracle Masternodes will perform many pivotal roles for the Wagerr network. From providing fixtures and resulting, forging smart contracts and ensuring pay-outs, to voting on network and protocol changes and the evolution of the platform. They will be rewarded in kind, receiving not only block awards but 50% of all betting fees. At a limited number of 2,000 Oracle Masternodes, sharing 50% of the betting fees from the only truly global sportsbook in the world, you may be looking at one of the hottest properties in all of cryptocurrency in 2018 and in years to come. Detailed information on how to set up and activate your Oracle Masternode will be available on launch of the main and test networks on Jan 15th, 2018. The Wagerr code is ready, however in our attempt to re-launch the chain we are running into a mining error that is preventing us from starting the chain error-free. We have a solution, but our current fix may comprimise the long term security of the network. We are currently assessing the implications of this fix. We are committed to the long term viability of the project, and will continue to work until it is resolved. We have thought hard about this decision, collectively as a team, and feel this is the best decision, rather than rushing out a product which may have costly implications down the line. We will update the community in the next 12 hours. Thank you for your patience. Start your Wagerr Mainnet wallets. Swap your Wagerr tokens for WGR Mainnet coins. Wagerr Mainnet wallets are available for download. Please follow theseinstructions to set up your wallet and prepare it to receive Wagerr Mainnet coins. If you never moved your coins from wagerr.com, transferring them to your Wagerr Mainnet address is straightforward. 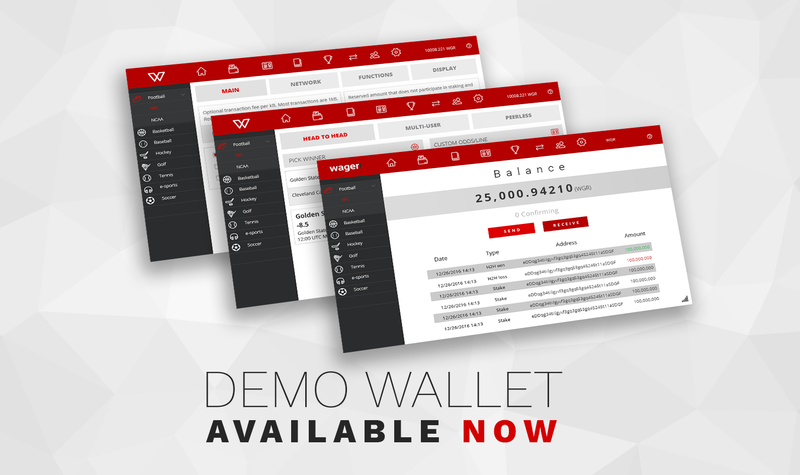 Visit wagerr.com to download the wallet, log in, and enter your Mainnet address to receive your coins. If you are transferring Wagerr-over-Waves tokens by sending them to the official gateway address, you mustinclude your Wagerr Mainnet wallet address in the attachment field on your Waves wallet. Since there are multiple versions of the Waves wallet, instructions for each version are spelled out in detail. The team has done its best to streamline the process by pre-populating the Wagerr-branded Waves wallet with the official gateway address. The Wagerr-over-Waves web wallet (available on wagerr.com) also pre-populates the official gateway address. If you choose to use the generic Waves wallet, you will have to enter the gateway address manually and also include your Wagerr mainnet wallet address in the attachment field. The result will be the same, but the customized versions are more straightforward because there are fewer variables. To allow fair access, there will be no block rewards until block 10,000. Keep in mind, that if you choose to stake, every stake will cost 0.00001480 Wagerr in network transaction fees. To prevent this, you can add the parameter staking=0 to the configuration file. Up next in the graduated rollout of the Wagerr Mainnet: Masternodes! Stay tuned for instructions on setting them up.